All businesses need to keep track of their PCs and software, and several products already help small businesses with this chore.&#160;Now a new service, Paglo, leverages the expertise of a small but growing community to help you manage your networked hardware and software. You can configure any number of Paglo dashboards to monitor items of most interest to you. The service is unusually flexible and can be configured to suit the needs of a wide range of businesses, from a small&#160;outfit with a simple&#160;ten-computer network to a sophisticated midsize business with&#160;a thousand&#160;systems. Managing a fleet of PCs has always been difficult for smaller businesses. They can't afford the high-end tools from Tivoli and others that are aimed at large enterprises, but because they are typically short on IT staff, they need automated help to monitor their computer network assets and resolve problems. That's what makes Paglo, which opened to beta testers this week, so valuable. You can use its downloadable software to index the hardware and software on your internal network, and then monitor your network operations using a series of dashboards. Paglo can search for and alert you about computer problems, then help you drill down to examine&#160;PC operations in more detail. A small but growing Paglo user community (some 900 businesses have tried the service in alpha testing for several months) shares ways on how to search for problematic IT issues. Paglo is an impressive work-in-process. It has a few quirks, but offers a lot of value for a small to midsize business struggling to manage computer assets. The service is free during the indeterminate beta test period. The company calls Paglo the world's first search engine for IT, but that's misleading because it isn't an Internet search engine. Rather, it handles searches related to your internal IT assets--and it's not the first product or service to do so. For example, you can find out how many copies of Microsoft Office are installed on your network's PCs or locate all PCs attached to your network. In this mode of operation, Paglo is similar to other computer asset management applications, such as Total Network Inventory, which I reviewed last year. What differentiates Paglo from simple asset management software is the ability to expand its functionality by tapping into the experience of the Paglo community by using Share-Its--configured searches, dashboards, and alerts developed by others&#160;that you may apply to your network assets. Then you download the Paglo Crawler software, install it on a PC with administrator privileges, and answer a few questions to configure it to access your network. Currently two versions of the crawler exist, one for Windows XP and one for Vista, though they will eventually be merged. The crawler will explore and discover computer network assets and record them in a searchable index. It takes just a few minutes to install the crawler, but indexing requires more time--possibly 24 hours, according to the company. If you have a common admin account for all your networked PCs and have Microsoft's WMI (Windows Management Instrumentation) installed in Windows, the discovery process should go relatively smoothly. If you do not, then you've got some work to do to configure permissions, and to download and install the free WMI software available on Microsoft's Web site. Paglo has a bright and informative user interface. 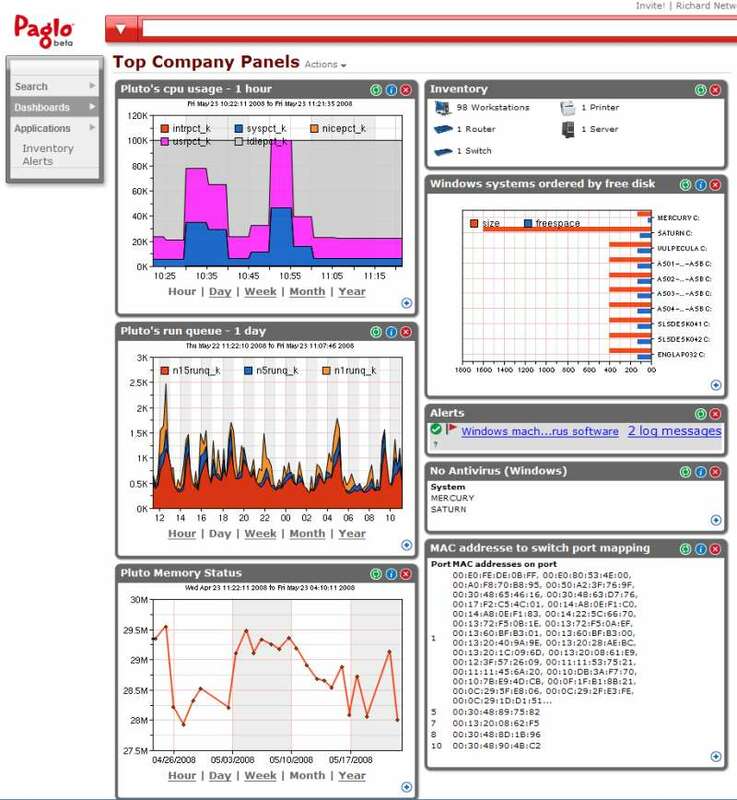 Built-in dashboards with charts let you visually monitor the status of devices on the network, such as an overheating PC.&#160;It also provides a listing of computer network inventory--hardware and software, or what accountants refer to as network assets. You may set up alerts for specific conditions, such as when a Windows disk reaches 95 percent or more of its capacity. And you can configure each alert to be e-mailed or sent to you via Twitter. Similarly, you can configure dashboards to monitor items of most interest to you. A tutorial walks you through setting up a dashboard, and you may add saved searches to it. Dashboard design is quite flexible--yours can be as simple or as sophisticated as you need it to be. You can create as many dashboards as you need. If you're ambitious, you can set up what amounts to your own virtual NOC (Network Operation Center) to monitor bandwidth, CPU and memory usage, and critical processes. A few&#160;common searches, such as a listing of applications software, are linked to icons. You can develop your own searches, but Paglo's complete SQL-like query language includes more than the mostly plain English of Google. It will require some time to learn to search most effectively. Creating a custom search is probably the most difficult part of using the service. Here's where the Share-Its developed by Paglo's user community can make things easier and really differentiates the online service from packaged network asset apps. You can use search syntax developed by someone else. Plug-ins for the open-source crawler can extend it to more devices. As the community grows, the Share-Its offer a way to enhance Paglo's functionality and make it easier for inexperienced network administrators to use. Paglo is designed to support businesses with up to 1000 employees. However, it's probably overkill for a microbusiness with&#160;fewer than&#160;five PCs. I'm impressed by Paglo's flexibility, which lets you customize the service to suit a wide array of network management needs, from basic to advanced. The user interface is clearly understandable, and the array of charts lets you view a snapshot of operations at a glance. If you're not satisfied with your current network management setup, I recommend you try Paglo. As noted, Paglo is free to use during beta. After launch, the company plans to charge a fee (not yet determined) to use an advanced service, but a basic service will remain free. Richard Morochove is an IT consultant and writer. Send him questions about using technology in your connected small to mid-sized business via e-mail. PC World may edit your query and cannot guarantee that all questions will be answered.